Milk Thistle belongs to the family Asteraceae. As raw material for pharmaceutical industry used the seeds and fruits of plants that contain a complex of vitamins, minerals and trace elements, as well as resin, mucus. The most valuable raw material is considered to be because of the content of silymarin, which cleanses the whole body and it has hepatoprotective, cholagogue and choleretic effects on the liver. Take milk Thistle in the form of decoctions, herbal tea, dried powder, tea and in the composition of medicines. 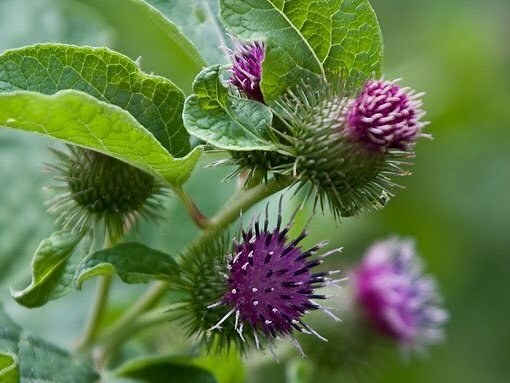 How to take a "Karsil"
Take milk Thistle for any liver, gall-bladder and biliary ducts. Not recommended reception only in the case if you were diagnosed with the presence of stones or obstruction biliary tract. If you were poisoned with chemical compounds or substandard products, alcohol, or drugs, the intake of milk Thistle will allow you to quickly bring the toxic substance from the body, and normalizes the liver, which suffer the most from any toxins. If you suffer from allergic reactions, varicose veins, frequent headaches, colds or viral infections, lack of digestion, constipation, colitis, obesity, multiple sclerosis, the doctor you can recommend taking milk Thistle. To prepare an infusion of raw materials, pour 2 tablespoons of crushed seeds or fruits of milk Thistle in a thermos, pour half a liter of boiling water, insist 12 hours, strain, press. Take half a Cup 3-4 times a day. To prepare the broth, pour into a container 2 tbsp. minced raw, pour a half liters of boiling water, cook in a water bath for 20 minutes. Strain, press, add boiling water to the original volume, stir, take half a Cup 3-4 times a day. Infusion and decoction, take 30 minutes before meals. If you bought milk Thistle in powder form, take 1 teaspoon 4 times a day, drink powder and 1 Cup water. If you have an milk Thistle in pills: karsil, legalon, silimar, follow the doctor's recommendations or read the annotation from the manufacturer and take medicines according to instructions. The broth you can make from not ground seeds of milk Thistle. To cook, place 3 tablespoons of seeds in a container, pour 1 liter of boiling water, put on fire, bring to a boil, continue to simmer until you bring initial volume up to half. Strain, press, take half a Cup 3 times a day warm. If you bought milk Thistle in tea bags, brew them as tea and drink on an empty stomach 1 glass 3 times a day. Milk Thistle - a species of Thistle. It has many other names: milk Thistle, silver Thistle, Carlina, Marin Thistle. This plant has large spherical inflorescences-baskets reddish-purple color and large green leaves with lots of spines at the edges. On well fertilized soil it can grow to nearly 2 metres. Milk Thistle in ancient times used in folk medicine for the treatment of various diseases. Before beginning treatment with milk Thistle it is necessary to consult with your doctor. When using this plant for the purification of the liver may cause discomfort and slight pain. Silybum marianum has many useful properties. This plant contains a substance called silymarin, which renews the liver cells and helps to protect it from toxins. In addition, milk Thistle contains flavonoids, fatty and essential oils, macro - and micronutrients, vitamins, aromatic resin. Silybum marianum is used in traditional medicine in the treatment of liver diseases (cirrhosis, hepatitis), spleen, intestine and gall bladder, with drug poisoning, kidney stones, psoriasis, chronic cough, when women's diseases (vaginitis, erosions), difficult healing wounds and ulcers, open fractures. Milk Thistle tincture has sedative and choleretic action. The infusion of this plant is used to improve the health in diseases of the liver. The juice from the leaves of the milk Thistle is used in diseases of the joints, sciatica, diseases of the stomach, constipation and inflammation of the colon. 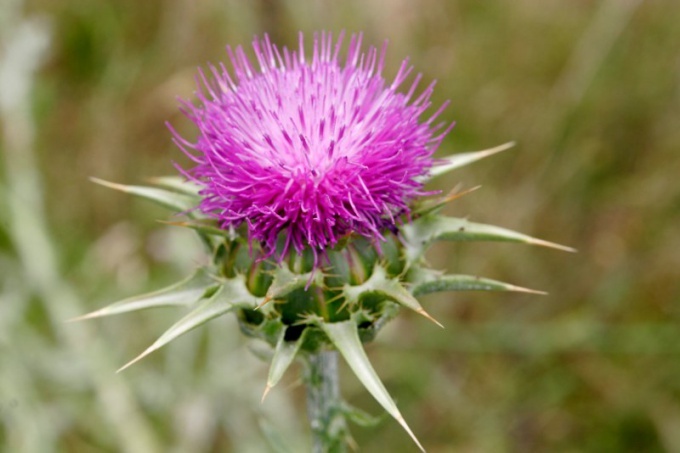 Thistle oil has anti-ulcer, wound healing and anti-inflammatory properties. It contains large amounts of vitamins, especially vitamin E, an antioxidant, protects cells from aging and dying. Oil milk Thistle improves the condition of skin and hair. It participates in the process of detoxification of harmful substances that can penetrate into human body with food and water. Milk Thistle is used in the treatment of hepatitis, liver dystrophy, gallstone disease, alcoholism, poisoning with toxins, and varicose veins. In addition, the seeds of this plant to purify the blood and reduce the level of blood sugar. A decoction of the roots of milk Thistle in folk herbal medicine used for cramps, sciatica, diarrhea, and also for toothache as a rinse. On the basis of the seeds of milk Thistle manufactured drugs for the treatment of liver "Silibor" and "Karsil". To prepare a decoction of milk Thistle seed 30 g of powdered raw materials you need to pour 0.5 liters of hot water, then boil in a water bath until the water is reduced by half, then strain through 2-3 layers of cheesecloth. Take the resulting broth should be during the day at 1 tbsp every hour. The course of treatment is 1-2 months. You can also use this plant in the form of dry seeds powder: 1 tsp 3-4 times a day before meals. The powder must be washed down with warm water. A decoction of the roots of milk Thistle is prepared from the calculation: 1 tablespoon of raw materials to 1 Cup of boiling water. This mixture is boiled on a water bath in a closed enamelware for half an hour, filtered hot through 2-3 layers of cheesecloth, wring out, and then bring the volume of boiled water to the source. Broth should take 1 tablespoon 3 times daily, before meals. Milk Thistle is useful not only to patients but also healthy people: the use of this remedy strengthens the ability of the liver to cleanse the body of toxins. To heal the body, strengthen the immune system and clean liver this plant can be added to food in a meal (milled into flour, seeds) or oil. Mealpowder can be applied up to 4 tsp a day, the oil to 3 tbsp, You can add a meal of milk Thistle in soups, cereals, salads, batter in the cooking process of baking. Also meal can be brewed and consumed as herbal tea. The use of milk Thistle has no side effects, as well as strict contraindications. - children up to age 2 years, from 2 to 4 with caution. Milk Thistle is a herbaceous plant belonging to the family Asteraceae. Its fruits are used for medicinal purposes. The plant contains silymarin, belonging to the group of flavonoid compounds. The drugs with milk Thistle extract is used in liver diseases. The drug is plant-based "milk Thistle" is prescribed in the following indications: toxic liver damage (alcoholism, intoxication, drugs, heavy metal compounds, halogenated hydrocarbons) and their prevention, chronic hepatitis, post-infectious and toxic hepatitis, fatty infiltration and degeneration of the liver, lipid disorders, cirrhosis (in the complex treatment). Often, patients with impaired digestion due to liver disease have an increased appetite and overweight. Because "milk Thistle" leads to normal metabolic processes in the diseased organ, in humans normal weight. The drug improves the liver function tests. "Milk Thistle" release in the form of capsules, tablets, powder, oil for ingestion. 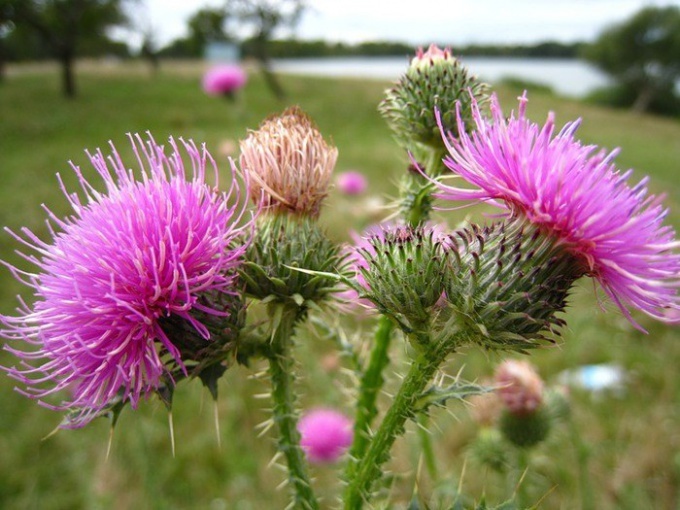 Thistle oil is prescribed to adults and children over 12 years 0.5 tsp twice a day. He has to take it during meals. The course of treatment is 1 month. "Milk Thistle" capsules used in the following manner: adults and children over 12 years should take 5 pieces twice a day (during meals). The course is 30 days. Take pills during meal, 1 piece 1 time a day for a month. Treatment with milk Thistle can not replace abstinence from alcohol and products that are harmful to the liver. Preparations based on milk Thistle can have side effects, which include diarrhea and allergic reactions. These medications are contraindicated in children up to 12 years old with hypersensitivity to the components. During pregnancy and lactation "milk Thistle" is used only for medical reasons and in that case, if the benefits of treatment will be higher the possible risk to the child. With care "milk Thistle" is used when hormonal disorders (uterine fibroids, endometriosis, breast cancer, uterine, ovarian, prostate) because of estrogen-like actions of silymarin. In a joint application of the extract of milk Thistle with drugs intended for hormone replacement therapy and oral hormonal contraceptives may decrease the therapeutic action of these funds. Silymarin is able to enhance the therapeutic effect of these drugs: "Alprazolam", "Diazepam", "Lovastatin", "Ketoconazole", "Vinblastine". Analogues of the "Thistle" on the active substance are: "Karsil", "Legalon", "Cilegon", "Silymarin", "Silimar". Analogs pharmacological group: "Astralis", "HEPA-Merz", "Hepatosan", "counts", "Livadaki", "Progear", "Tilion".